when dev and i first found out that i was pregnant we decided that while i was in the somewhat fragile early stages, we’d keep the news pretty quiet. which was incredibly hard for both of us to do. one day dev suggested i start writing letters to ‘nori’ (that’s his codename for the baby) so that i could at least have some kind of outlet for my hard-to-contain-excitement. so over the course of the past few months i wrote a few of these letters. today i saw a miracle – your infinitesimally small heart beating. it was just a tiny flickering flash in the middle of an inexplicable bundle – a twinkling star is the closest thing i can compare it to. and i’ve experienced a lot of profound beauty in my life, but experiencing your heartbeat was one of the most magical moments i’ve ever encountered. your father and i arrived early to our appointment, both nervous and excited and wide-eyed. when the doctor did the ultrasound i desperately searched the screen for you. the doctor pointed to what looked like a tiny grain of rice, and declared “well, yes. you are certainly pregnant. we can all agree on that”. i gasped. i grabbed for your father’s sweating hands and we just clutched each other staring at the screen. we both tried to contain our excitement but our elation was obvious. 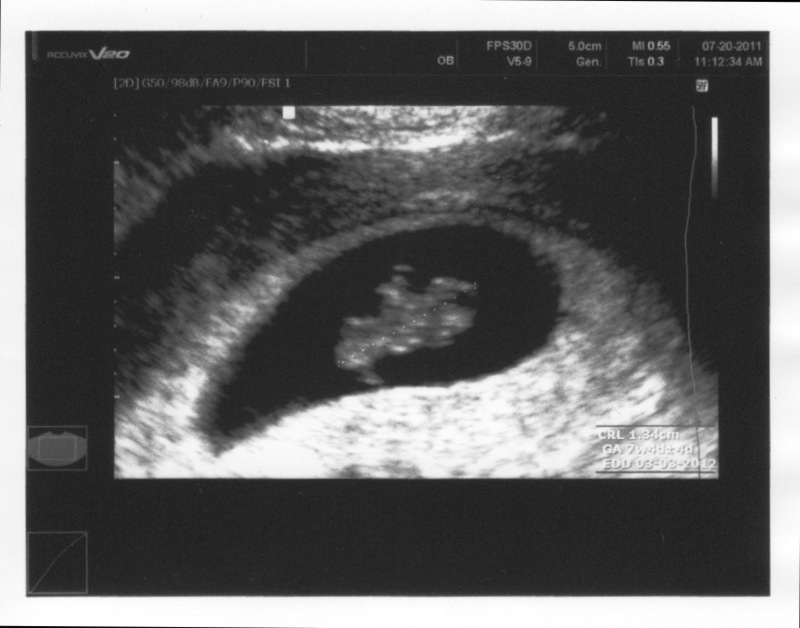 the doctor did some measuring and came up with your estimated due date – february 28 2012. wow. i’m still at a loss for the adequate words to how to explain how i’m feeling. it’s so foreign for me to feel this level of fear. i suppose it’s the first time i’ve felt such a personal investment in another person’s heartbeat. once again, the responsibility of it all, of you, floors me. we are having a difficult time keeping you a secret and have decided that tonight we’ll tell your grandparents. if she was still with us, it would have been your great-grandmother carol’s birthday today and i know that she had a hand in this so we feel it’s only right that we give this gift of you to your grandmother, nikki. it makes me smile to think of our parents as your grandparents – you are such a lucky little one as your grandparents are of the highest caliber and they will completely adore you. i downloaded a bunch of pregnancy apps on my iPhone and they tell me that you are now about the size of a pea. which is supposedly 10,000 % the size you were one month ago. i can’t even get my head around what’s happening. cells dividing and organs forming and limbs sprouting and the fact that there are two hearts beating in my body. what?! and i’m also learning how to manage the physical ramifications. i’m tired. exhausted. i want to nap in a cool room with crisp white sheets and read books for days. i feel nauseous all the time but strangely i still have an appetite and i guess you might be taking after your papa in your tastes because all i’m craving is meat. today i ate a bunch of roast beef and half a steak for dinner. only your father would think of that as a balanced meal. there’s also a bit of latent sadness lingering. i can’t pinpoint where it stems from but i think it has to do with being alone. i don’t have my mother here. and though we have close friends in LA, we are not super close to other young parents who have been through this. all the new mothers i’m close to are in nashville or australia. so for now, my world of support feels small and intimate. but i have you. and it fills my heart to know that even in my loneliest moments, my soul is sharing this body with another precious soul. thank you for being with me. Way to make me tear-up just before I leave for class :) Lovely. Oh my goodness. Well, this is sweet for so many reasons, but I really want to thank you for being so honest with the range of emotions you are feeling during this process. It reminds us all how normal and human it is to feel sadness and other feelings along with the joy and excitement. so very neat. congratulations to you both! that’s a great way to write to your baby. i think life got in the way. it’s hard not to want to share the news.